Veteran Democratic political strategist Donna Brazile is an adjunct professor, author, syndicated columnist and the Vice Chair of Voter Registration and Participation at the Democratic National Committee. She has worked on every presidential campaign from 1976 through 2000, when she served as presidential campaign manager for former Vice President Al Gore. Brazile is author of the best-selling autobiography Cooking with Grease: Stirring the Pots in American Politics, and Hacks: The Inside Story of the Break-ins and Breakdowns that Put Donald Trump in the White House. Brazile is an adjunct professor at Georgetown University where she shares her passion for encouraging young people to vote, work within the system to strengthen it and run for public office. In the media, she serves as a political contributor on CNN; consultant to ABC News; regularly appearing commentator on ABC's This Week with George Stephanopoulos; and frequent contributor to NPR.. Veteran political strategist Donna Brazile is the former interim Chair of the Democratic National Committee (DNC) and the author of the New York Times bestseller Hacks: The Inside Story of the Break-Ins and Breakdowns That Put Donald Trump in the White House and the 2004 best-selling memoir Cooking with Grease: Stirring the Pots in American Politics. She is a co-author of For Colored Girls Who Have Considered Politics. Ms. Brazile has devoted her life to working for progressive change, responsible governance, and the advancement of all people in a society that is fair and equitable. Brazile first got involved in politics at the age of nine when she worked to elect a City Council candidate who had promised to build a playground in her neighborhood; the candidate won, the playground was built, and a lifelong passion for political progress was ignited. Brazile has worked on every major presidential campaign since 1976 and in 2000 Ms. Brazile became the first African American woman to serve as the manager of a major party presidential campaign, running the campaign of former Vice President Al Gore. Ms. Brazile loves working with young people, encouraging them to vote, to run for office, and to work within the system to strengthen it. She has lectured at over 200 colleges and universities across the country on such topics as “Inspiring Civility in American Politics,” “Race Relations in the Age of Obama,” “Why Diversity Matters,” and “Women in American Politics.” In 2013, Ms. Brazile was appointed by President Obama to serve on the J. William Fulbright Foreign Scholarship Board. She is also the proud recipient of more than ten honorary doctorate degrees from major colleges and universities, including her alma mater Louisiana State University. In October 2017, Ms. Brazile was the recipient of the W.E.B Du Bois Medal, Harvard’s highest honor in African American studies. Brazile has served as an adjunct professor at Georgetown University since 2002 and spent the fall of 2017 serving as a Joan Shorenstein fellow in Media, Politics and Public Policy at the Harvard Kennedy School. Howard University appointed Ms. Brazile as the 2018-2019 Gwendolyn S. and Colbert I. King Endowed Chair in Public Policy. In this role, Brazile will develop and host a five-part lecture series to engage the Howard community on several subjects, including politics, voting, criminal justice reform, and civility. O, The Oprah Magazine chose Ms. Brazile as one of its 20 “remarkable visionaries” for the magazine’s first-ever O Power List. In addition, she was named among the 100 Most Powerful Women by Washingtonian magazine, Top 50 Women in America by Essence magazine, and received the Congressional Black Caucus Foundation’s highest award for political achievement. 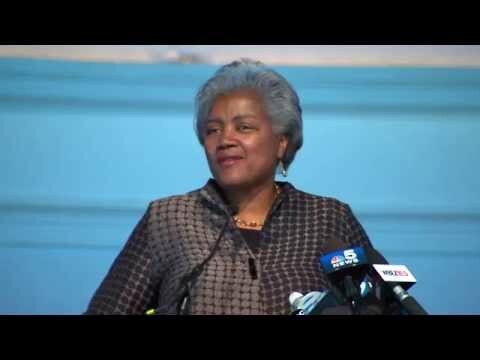 In 2016, Ms. Brazile was awarded Wonk of the Year from the Kennedy Political Union at American University. In March 2018, Black Enterprise awarded Ms. Brazile with the Barbara Graves Legacy Award. Ms. Brazile has worked passionately on behalf of her beloved hometown of New Orleans. In the aftermath of the two catastrophic hurricanes that devastated the Gulf region, Ms. Brazile was appointed by former Governor Kathleen Blanco to serve on the Louisiana Recovery Board to work for the rebuilding of the state and to advocate for the Gulf recovery on the national stage. Ms. Brazile was also appointed by New Orleans Mayor Mitch Landrieu to serve on the Tricentennial Commission. Ms. Brazile was formerly a contributor to ABC News and CNN. Ms. Brazile was the recipient of a Daytime Emmy Award for Outstanding Daytime Program, Good Morning America (2016-2017) in connection with her work with ABC. She has also been a syndicated newspaper columnist for Universal U’Click and a prolific writer with articles appearing in nearly every major newspaper in the nation. She moonlights as an actress and is especially honored to have made three cameo appearances on CBS’s The Good Wife, and two cameo appearances on Netflix’s series House of Cards. She most recently appeared on BET's Being Mary Jane. Ask her and she’ll tell you that acting, after all, is the key to success in politics. Ms. Brazile is the founder and director of Brazile & Associates LLC, a general consulting, grassroots advocacy, and training firm based in Washington, DC. Always candid and insightful, Donna Brazile brings a refreshing perspective and practical sensibility to the Obama Administration and Congress. Her presentations provide a comprehensive picture of what’s going on in Washington—from analysis of the current political environment to hot-topic legislation. Named by Washingtonian as one of the “100 Most Powerful Women,” Brazile draws on her insider knowledge to provide audiences with a the latest development of an ever-shifting political landscape, the critical issues facing America and what their impact means for our future. Together, two of the most celebrated women in politics, Mary Matalin, former Republican presidential advisor, and Donna Brazile, veteran Democratic political strategist, draw on over 50 years combined in politics and a 30-year close friendship to share with audiences an entertaining, candid and sharp analysis of Washington politics and the gut issues that surround the 2016 race for the White House.